1./ Ensure you have selected a concrete mix design that is capable of withstanding the environment where it’s placed. In the area where we live, northeastern Pennsylvania, we have some of the harshest freeze-thaw effects in the nation. It is recommended for outdoor use that we pour a 4,000-psi mix with air entrainment of approximately 5 percent, plus or minus 1 percent, and most importantly, we must keep our water-to-cement ratio in the area of 0.40 or less. The concrete spec for your area may be different due to your climate and season. 2./ Utilizing concrete from a reputable ready-mix supplier using sound aggregate is a must. I have seen plenty of defects after winter due to either soft or reactive aggregate being utilized in the mix. This can lead to scaling or pop-outs. 3./ Avoid long transit times for the ready-mix and excessive mixing at high speed. Both could deplete air entrainment in your concrete, leading to durability issues. 4./Proper placement and finishing techniques must be utilized throughout the installation process to ensure quality concrete. 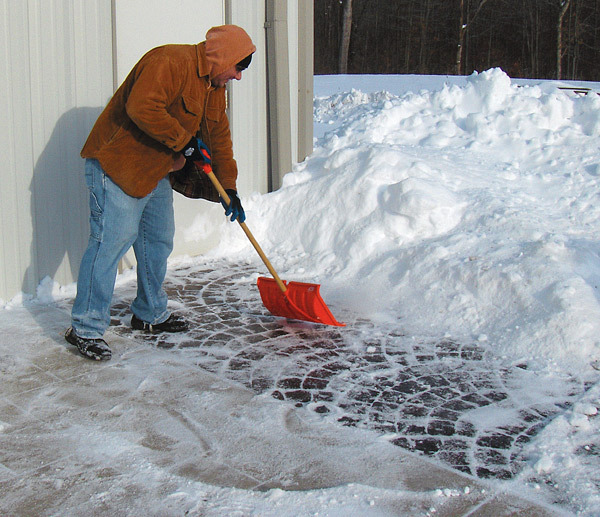 If you are pouring in winter months you should never pour on frozen ground. Under- or overworking the concrete and premature finishing can cause durability issues with the surface. Extra water added at a job site can also lead to surface problems and poor finish quality, especially if the mix design you’re using has not achieved the desired water-to-cement ratio. 5./ Curing must be taken into consideration for long-term success. If you’re pouring in winter months your concrete must gain at least 500-psi strength before it is exposed to freezing temperatures. If the surface is exposed to frost or freezing temperatures prematurely on the original day of the pour, the long-term durability of the surface will very likely suffer. It is imperative to select a day during which you have acceptable weather conditions and above-freezing temperatures throughout the pouring and the initial set of the curing process.